My Comments: So much for being an optimist. There’s a point where it simply makes sense to take your money off the table and put it under the mattress. At least for a while. The markets are being driven by those who are convinced Donald Trump is the second coming. These folks seem convinced that ‘this time it’s different’ and that corporate earnings are going to go through the roof. Life NEVER moves in a straight line. Investors have forsaken all reason, logic and wisdom by rushing into the biggest stock and financial bubble in history. Even some precious metals investors are selling their gold and jumping into the markets hoping to make big profits as President Trump takes over the White House in six weeks. Unfortunately, the worst time to jump into a market is when everyone else is doing the same thing. Of course, this doesn’t mean the Dow Jones Index won’t continue higher for some time, but the fundamentals of the economy continue to rot from the inside out. No one really notices this as automobile dealers are now selling cars with zero interest rates, nothing down and no payment for 6 months. If this is the sort of business model the automobile industry has to resort to in order to continue sales, we are in big trouble. These are just some of the many headlines pointing to an economy and stock market that is not heading towards better times. It was interesting to read that ESPN lost 621,000 subscribers in one month. However, ESPN has lost over 15 million subscribers in the past five years. As we can see from the chart, investors lose all economic and financial sense when asset prices start to go insane. Instead of using some restraint and wisdom, they drop all reason and jump in on the rising bandwagon. 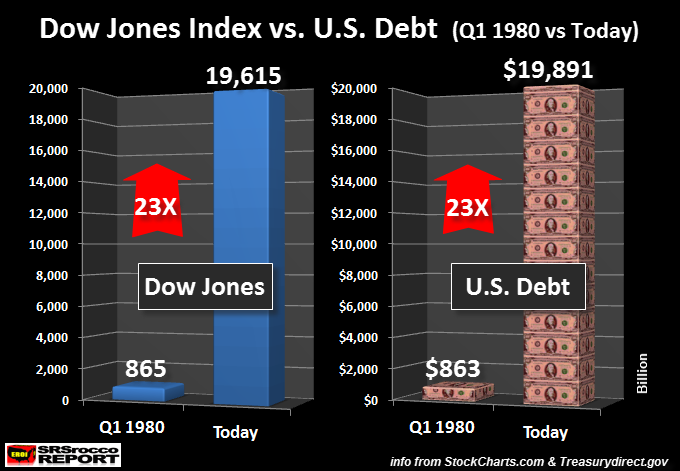 In 36 years, the Dow Jones Index and the U.S. debt have increased at the same exact ratio… 23 TIMES. This is no mere coincidence. Investors who have parked their hard-earned money into market have placed their bet on stocks that are backed by nearly $20 trillion in U.S. debt. So, there is a race for either the Dow Jones or U.S. debt to reach the 20,000 mark first. I put my money on the U.S. debt, which is only $100 billion away from that goal. Furthermore, the U.S. Retirement Market is up 24 TIMES since 1980, and the S&P 500 is up nearly 21 TIMES. 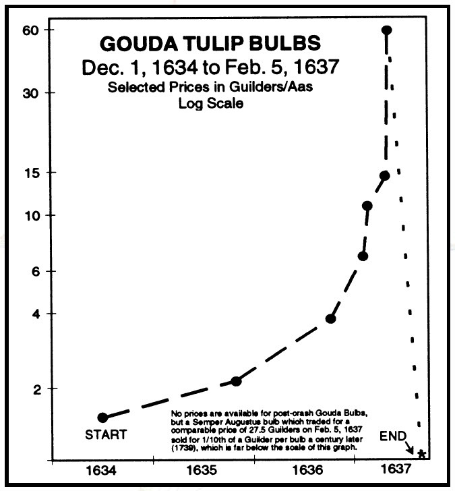 So, we can clearly see that the massive increase in debt has provided the HOT AIR that has pushed the stock market up to Tulip Mania heights. 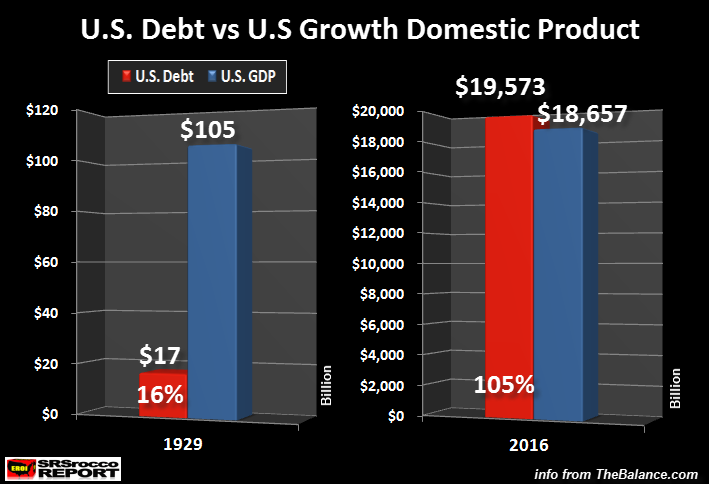 In 1929, right before the Great Depression hit, the U.S. debt was $17 billion versus a $105 billion Gross Domestic Product (GDP). Thus, the U.S. debt accounted for 17% of the U.S. GDP. If we fast forward to today, it is a much different picture. The U.S. debt is now 105% of the U.S. GDP. Basically, the U.S. economy is powered debt… and a lot of it. President-elect Trump may have grand ideas for the U.S. economy; however, his hands will be tied by the massive debt and terrible energy predicament overhanging the country. According to the sources I have read, nearly 10% of U.S. oil production is being produced by either bankrupt or financially challenged energy companies. I also mentioned in a prior article that the largest oil company in the U.S., Exxon Mobil (NYSE:XOM), had to borrow $8 billion in 2015 to pay dividends or CAPEX. Number two Chevron (NYSE:CVX) had to borrow even more at $18 billion to pay dividends and CAPEX in 2015. This is not a good sign for a healthy market to invest in. Unfortunately, this will not stop more precious metals investors from selling their gold to play in the Dow Jones Casino. The reason to hold onto precious metals is to protect oneself when the FAN FINALLY HITS THE COW EXCREMENT. Who sells their homeowner or automobile insurance to play in the stock market? This is how insane the mentality of investors has become.